Thursday 31st July 2015 – 8.50pm – Chris Kowalik. Four people have been taken to hospital, one by air ambulance, following a road traffic collision in south Worcestershire. 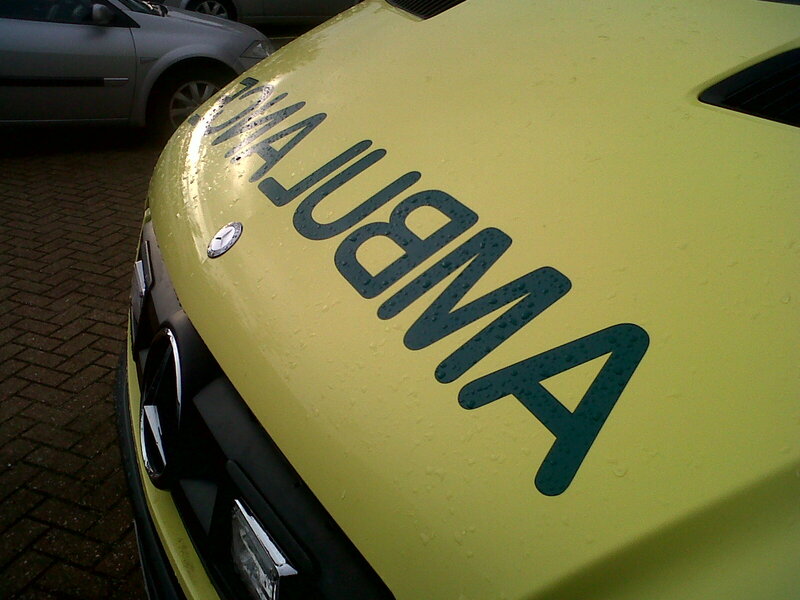 West Midlands Ambulance Service was called to the A46 at Norton shortly after 5pm today. Two ambulance crews, a paramedic area support officer in a rapid response vehicle and the Midlands Air Ambulance from Strensham attended. A West Midlands Ambulance Service spokesman said: “A woman in her sixties who was a front seat passenger in one of the cars had a head wound and a suspected leg injury. She was immobilised and was flown to Worcestershire Royal Hospital. The driver of the car, a man in his sixties,was taken to the same hospital by land ambulance with suspected concussion. Friday 31st July 2015 – 6.15pm – Claire Brown. A man has died whilst paragliding near the Staffordshire / Derbyshire border this afternoon. West Midlands Ambulance Service was called to a field in Hollingsclough near Buxton at around 1.30pm this afternoon (Friday). A community first responder, a paramedic area support officer, a community paramedic and the Derbyshire, Leicestershire and Rutland Air Ambulance with a doctor on board attended the scene. East Midlands Ambulance Service were also sent to the scene. A West Midlands Ambulance Service spokeswoman said: “The man was paragliding when he fell to the ground. “A local community first responder was first on scene and found the man in traumatic cardiac arrest being given excellent CPR by members of the public. 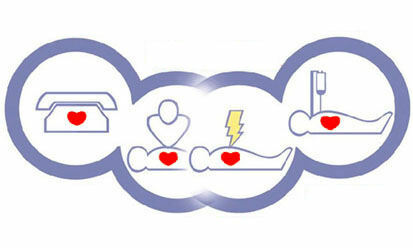 The CFR continued resuscitation attempts and was quickly joined by ambulance colleagues. Friday 31st July 2015 – 1.45pm – Chris Kowalik. A supermarket in Shropshire has chosen its local group of volunteer lifesavers as its charity of the year. Bridgnorth and District Community First Responder Scheme will benefit from the town’s Sainsbury’s store’s fundraising for the year and it begins today. Members of the team are in the main entrance to the store in High Town raising funds for the next three days. 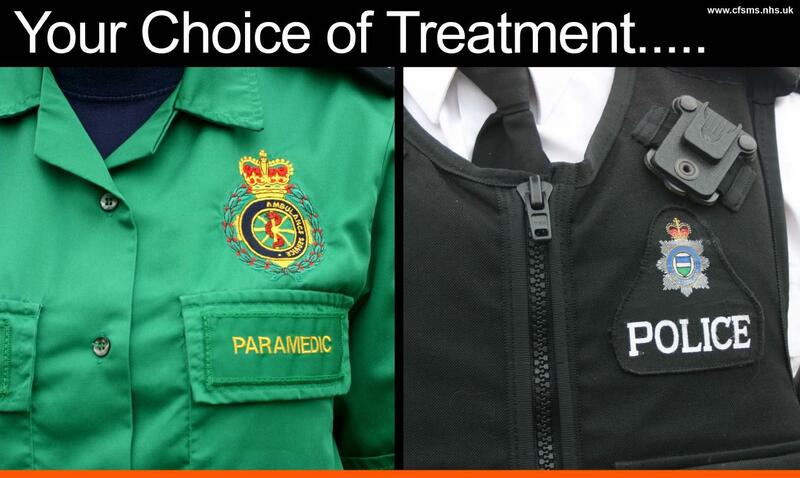 Community First Responders come from all walks of life and are trained by West Midlands Ambulance Service in a number of assessments and treatments. 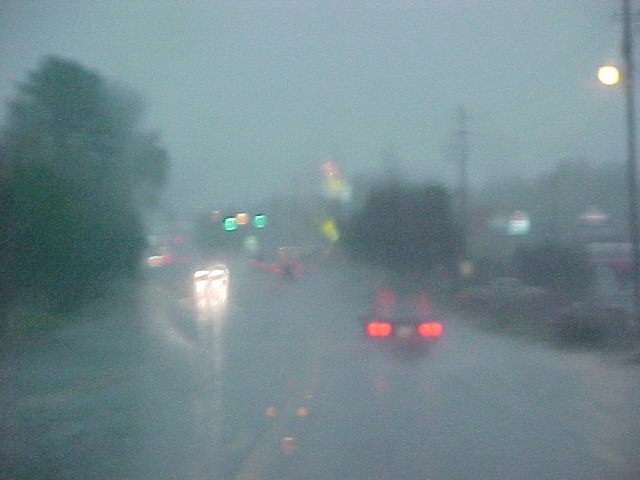 They may be called upon to attend a local medical emergency while a blue-light ambulance vehicle is en-route. 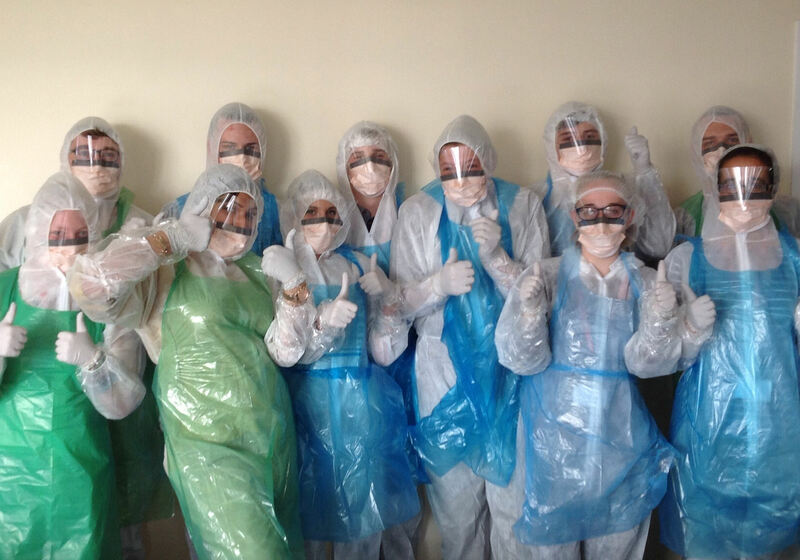 More than 450 apply for student paramedic vacancies! Friday 31st July 2015 – 12.45pm – Claire Brown. As the clock struck midnight last night, the Trust’s week-long recruitment drive for student paramedics came to a close with an impressive number of applications. The advertisement for 70 student paramedic vacancies went live on the NHS jobs website on Thursday 23rd July and closed at midnight last night. After just a week, 454 applications have been submitted. Louise Harris, the Trust’s Recruitment Advisor, said: “We’ve had such a fantastic response to our latest student paramedic recruitment drive. It just shows what a sought after job it is! “Our recruitment team have worked incredibly hard to look at the hundreds of applications to shortlist a total of 240 candidates. 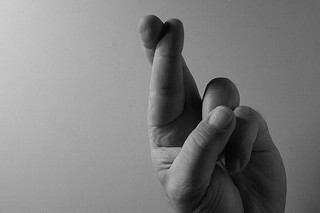 By now, applicants should have received an email from NHS Jobs to advise them whether they’ve been successful or not. “The main reason for applicants not being shortlisted was that they hadn’t applied for their category C1 driving license prior to applying for the student paramedic vacancy. Friday 31st July 2015 – 12.30pm – Chris Kowalik. An Ambulance Fleet Assistant with West Midlands Ambulance Service is to shave off his long hair for Macmillan Cancer Support. 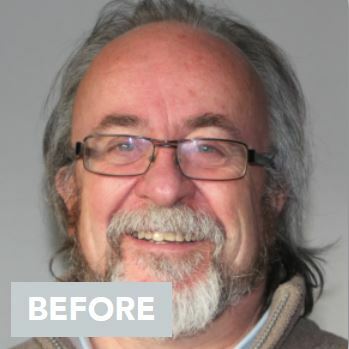 David Spry who is based at Hereford ambulance hub off Ross Road will ‘Brave the Shave’ on August 19th and has set himself a modest target of £300 to reach. He said: “I wish to support the sterling work Macmillan Cancer Support does and I know that many of us know of people, either friends or family, who have suffered from cancer. Friday 31st July 2015 – 11am – Chris Kowalik in conjunction with The Ambulance Services Charity. A leading figure in the UK Emergency Services has heralded the formation of a new national charity for the ambulance services as “meeting a very definite need” in the industry. Sir Graham Meldrum, Chairman of West Midlands Ambulance Service NHS Foundation (WMAS) Trust for almost ten years, met staff of TASC, The Ambulance Services Charity, on a visit to its new Midlands Head Office. He was on a fact-finding mission to the Coventry-based charity which was formed in March to help provide vital support services and advice to serving and retired ambulance personnel and ambulance service families in times of severe difficulty or bereavement. Before joining WMAS, Sir Graham was involved in the fire service for over 50 years which included being HM Chief Inspector of Fire Services for England and Wales and Chief Fire Officer of the West Midlands Fire Service as well as being appointed Chairman of the Fire Services National Benevolent Fund, which is now known as the Fire Fighters Charity. Sir Graham discussed ideas for TASC’s future development with Chief Executive Lorna Birse-Stewart, and how the two organisations can work together to promote and develop the UK charity. He said: “I contacted TASC because I thought this was a great opportunity for me to give them any benefit I can from my experiences. “We grew the Fire Services National Benevolent Fund from small beginnings into a large organisation which provides support and grants for firefighters and their families which is a similar mission to TASC except their focus is on the ambulance service. “There are a lot of small regional benevolent funds and associations which carry out their own fundraising. “TASC provides the opportunity for the whole ambulance services community to come together and get behind their own national charity which is dedicated to helping and support them. “It also gives the general public, who want to show their appreciation and thanks to paramedics and other ambulance staff who have helped them, the opportunity to make a donation for the benefit of the ambulance personnel and ambulance service families it supports. “I think TASC is meeting a very definite need because ambulance service personnel are facing increasing challenges and significant demands and this impacts in the same way as in other emergency services. Lorna Birse-Stewart, Chief Executive of TASC, said Sir Graham had also met Chairman Cliff Randall and Trustee Gordon Enstone during his visit: She said: “It was a productive and informative meeting and gave us the opportunity to explain the services we aim to provide to help support men and women throughout the ambulance service at times of crisis or severe difficulty. “There is a real need for a national ambulance services charity and TASC will play a vital role in focusing on the issues that are facing our ambulance staff and help address the significant impact that the daily stresses and challenges have. PICTURED: Sir Graham Meldrum, Chair of the West Midlands Ambulance Service NHS Foundation Trust (third, left) with, from the left, Cliff Randall, Lorna Birse-Stewart and Gordon Enstone from TASC, The Ambulance Services Charity. Picture: The Ambulance Services Charity. Friday 31st July 2015 – 9.30am – Chris Kowalik. Three people have been taken to a major trauma centre after a road traffic collision in Heathcote that ended with one car on fire and another on its side. West Midlands Ambulance Service was called to Harbury Lane at 11.30pm last night. Four ambulances, a Medical Incident Officer, a paramedic officer in a rapid response vehicle, a paramedic area support officer in a rapid response vehicle and the MERIT trauma team consisting of a trauma doctor and critical care practitioner attended. A West Midlands Ambulance Service spokesman said: “One of the cars had caught fire. A man who had been dragged from it had a broken leg, a suspected fractured pelvis, abdominal and chest injuries. A splint was applied to his broken leg and he was immobilised with the use of a scoop stretcher and neck collar. Fluids were administered intravenously and a medicine that prevents and treats bleeding problems was given. He was sedated and taken on blue lights to University Hospital Coventry and Warwickshire. “A woman who is believed to be in her forties was freed from the same car with the help of the fire service. She had chest, abdominal and pelvic injuries and multiple lower limb fractures. She was also taken on alert to the same hospital. “A woman in her twenties who managed to get out of the car that was on fire was checked over and discharged at the scene. Friday 31st July 2015 – 9.25am – Chris Kowalik. 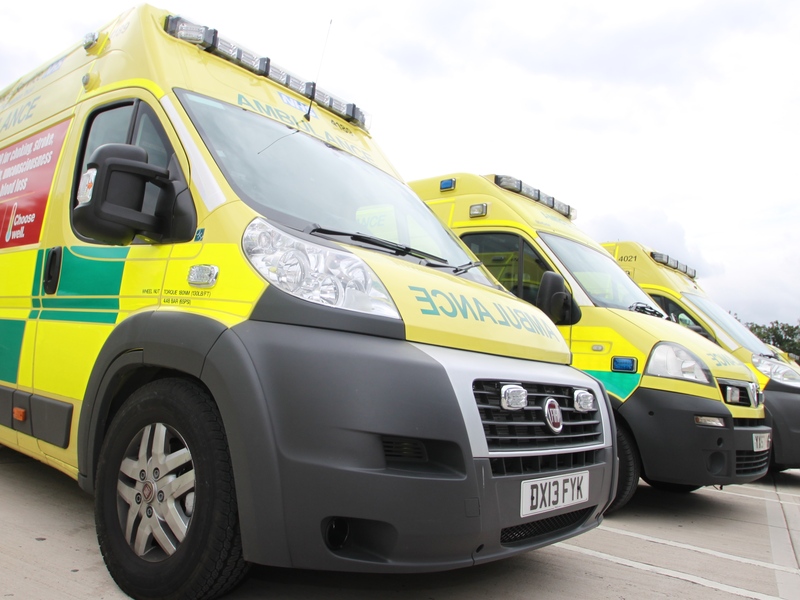 A man has been seriously injured in a collision with a van in the Black Country. West Midlands Ambulance Service was called to Birchfield Lane, Oldbury shortly after 11.50pm yesterday. Two ambulance crews, one of whom was passing the scene soon after it happened attended along with a paramedic area support officer in a rapid response vehicle. A West Midlands Ambulance Service spokesman said: “The man who is in his thirties, had a serious head injury. He was immobilised with the use of a spinal board, neck collar and pelvic splint. Thursday 30th July 2015 – 9.40pm – Chris Kowalik. A motorcyclist has died after colliding with a tree. 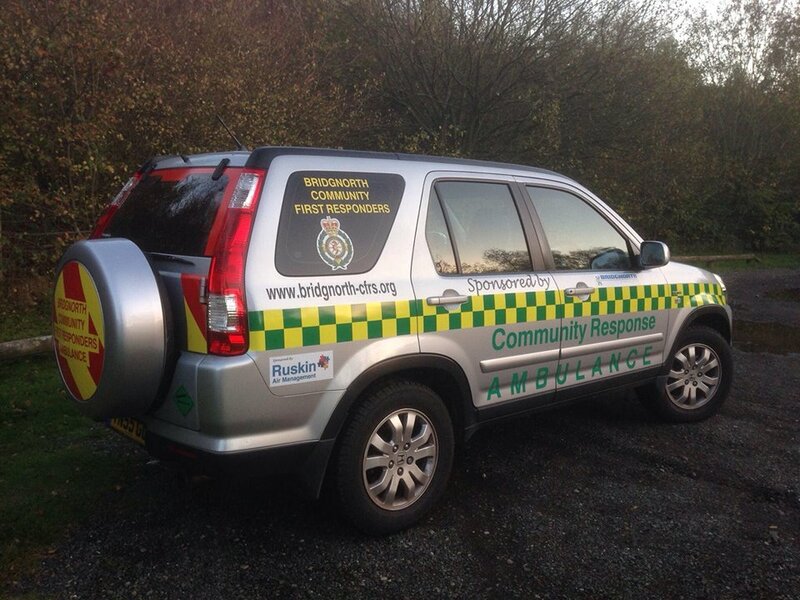 West Midlands Ambulance Service was called to the B4368 between Shipton and Weston shortly after 4.50pm today. A passing Community First Responder stopped to help until an ambulance crew and a paramedic area support officer in a rapid response vehicle arrived. Thursday 30th July 2015 – 6.25pm – Chris Kowalik. Two people have been injured in a crash involving a motorbike and a car that then ended up on its roof. West Midlands Ambulance Service was called to the junction of Mucklestone Road and Newcastle Road in Ashley Heath shortly after 3.50pm today. Two ambulance crews, three paramedic officers and the Midlands Air Ambulances from Staffordshire and Cosford attended. A West Midlands Ambulance Service spokesman said: “The motorcyclist, a man in his twenties, had wrist, eye, head and abdominal injuries and a suspected back injury. Splints were applied to his wrist and pelvis and he was given pain relief before being taken by land ambulance to Royal Stoke University Hospital. Thursday 30th July 2015 – 11.30am – John Hawker. A van and car have been in a serious collision this morning in Coventry. The crash occurred on the Bedworth Road, Longford at around 6.40am. Three ambulances and a paramedic officer attended the scene. A West Midlands Ambulance Service spokesman said: “Crews arrived to find a van and car that had both suffered substantial damage after being in a serious collision. The van was on its side and the car came to rest between a tree and a road sign. “The driver of the van, a man believed to be in his 50’s, suffered suspected abdominal injuries. He received emergency treatment at the scene by medics and his condition was stabilised. The man was then transferred to University Hospital Coventry and Warwickshire for further treatment. “The man and woman travelling in the car, both believed to be in their late 20’s, suffered suspected back injuries and also received treatment at the scene by medics. “Both were transferred by land ambulances to the same hospital for further treatment. Wednesday 29th July 2015 – 9.35pm – Chris Kowalik. 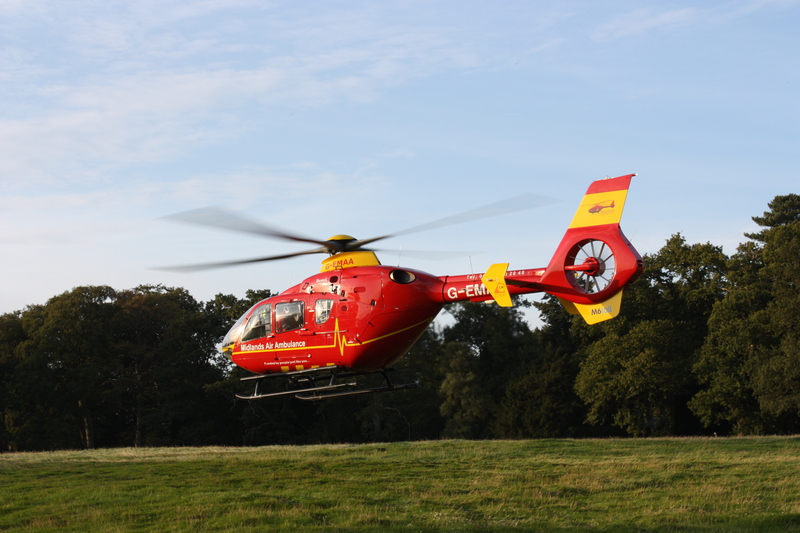 A seven year old boy has suffered a head injury following a fall while out walking with his family. West Midlands Ambulance Service was called to Stepping Stones in Dovedale, in the Peak District shortly before 4.40pm today. A Community First Responder was already in the area and was therefore first on scene, joined by an ambulance crew, a paramedic area support officer in a rapid response vehicle and the Midlands Air Ambulance from Staffordshire attended. They were helped by wardens from the National Trust which owns the land. The wardens helped to fetch and carry equipment and looked after the parents. Wednesday 29th July 2015 – 9.40am – Chris Kowalik. A defibrillator from the Royal Shakespeare Theatre in Stratford was used by a third-year medical student on a rower who suffered a suspected heart attack and then a cardiac arrest. It happened near the theatre and West Midlands Ambulance Service was called shortly after 8pm, sending an advanced community paramedic in a rapid response vehicle, a paramedic area support officer in a rapid response vehicle, an ambulance crew and the Warwickshire and Northamptonshire Air Ambulance. A West Midlands Ambulance Service spokesman said: “The man, who is believed to be in his fifties, became unwell in his boat which then capsized and he was submerged. Other rowers got him out of the water and dragged him to the side. When our crews arrived, the medical student had used the defibrillator from the theatre and was giving CPR. “Crews then administered advanced life support and he was sedated by the air ambulance doctor before being flown to University Hospital Coventry and Warwickshire and its awaiting trauma team. Wednesday 29th July 2015 – 9.40pm – Chris Kowalik. 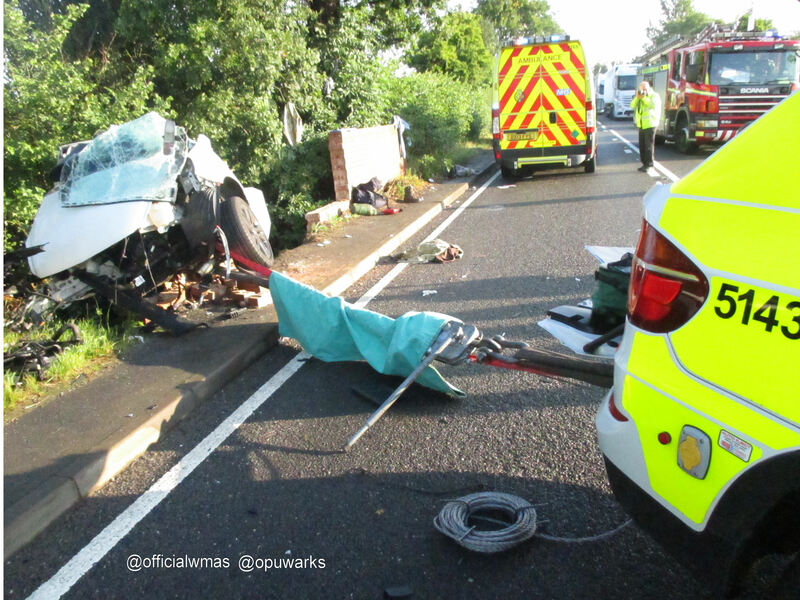 A man suffered abdominal and shoulder pains when the car he was driving collided with another on the outskirts of Kidderminster in north Worcestershire. West Midlands Ambulance Service was called to the junction of the A449 and Park Gate Road shortly after 8.10pm today. Two rapid response vehicles, an ambulance crew and the MERIT trauma team consisting of a trauma doctor and critical care practitioner attended. A West Midlands Ambulance Service spokesman said: “All the cars’ occupants were out of their vehicles except for a man in his forties. Wednesday 29th July 2015 – 5pm – Jamie Arrowsmith. A woman who was trapped for almost 30 minutes by the contents of a trailer has been treated for a leg injury by ambulance staff in Coventry this afternoon. West Midlands Ambulance Service was called to Church Road, Baginton, at 1.20pm and sent an ambulance and a paramedic area support officer to the scene. Crews from the Warwickshire and Northamptionshire Air Ambulance also attended in a rapid response vehicle, as did the police and fire services. A West Midlands Ambulance Service spokesman said: “On arrival, crews found a woman, though to be in her 60s, who had become trapped between a car trailer and some of the contents from inside it. “It is believed the trailer rocked backwards after being disconnected from a car, causing the woman to fall to the ground. She became trapped when two big wooden crates fell out of the trailer and trapped her leg against the trailer hitch. “She was given pain relief by ambulance staff who then worked closely alongside the fire service to carefully free the woman, a process which took about 30 minutes. Wednesday 29th July 2015 – 1.50pm – Jamie Arrowsmith. Two people have died following a collision between two motorbikes in Gailey, Staffordshire this morning. The incident occurred on the A5 towards Telford, approximately one mile from Gailey Island, shortly after 10am and West Midlands Ambulance Service sent an ambulance, a paramedic area support officer and a community first responder to the scene. 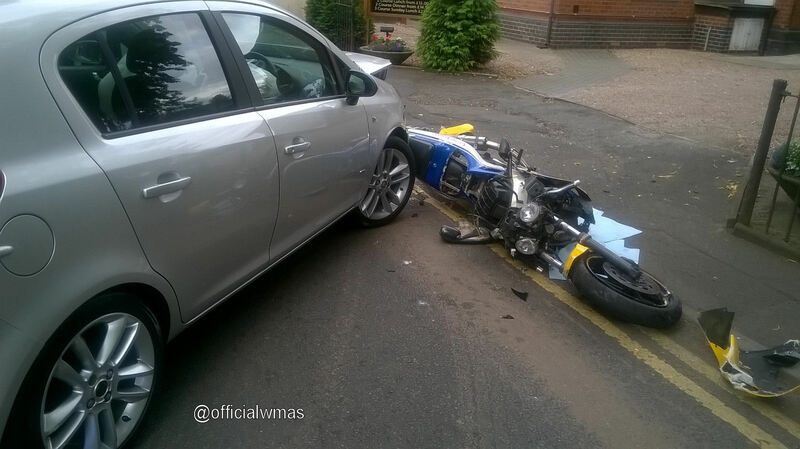 A West Midlands Ambulance Service spokesman said: “Crews arrived to find two motorbikes that had been in collision. “Unfortunately, it quickly became apparent that nothing could be done to save either of the two motorcyclists, both men, and they were confirmed dead at the scene. “A third patient, a woman who was in a van nearby and witnessed the incident, was treated for symptoms of shock, before being discharged at the scene. Wednesday 29th July 2015 – 1.40pm – Jamie Arrowsmith. 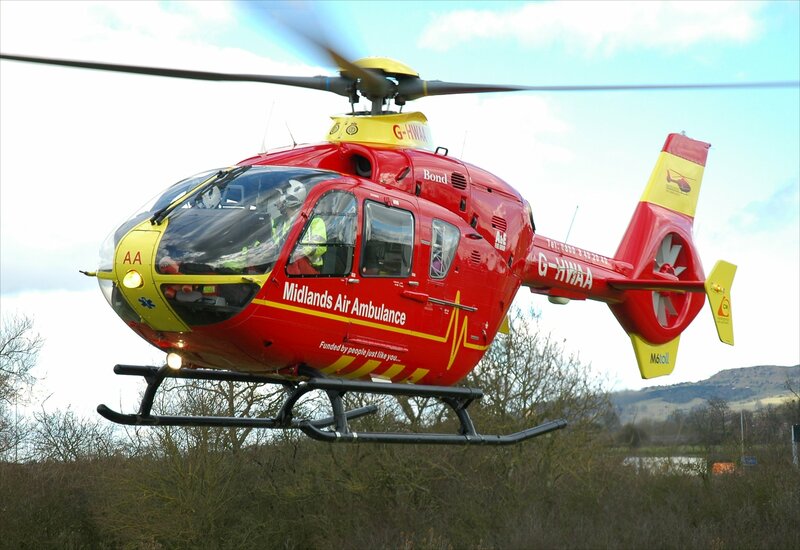 A pedestrian has suffered a serious head injury and been airlifted to hospital after colliding with a car in Kidderminster this morning. West Midlands Ambulance Service was called to Worcester Road shortly before 11am and sent an ambulance, a paramedic in a rapid response vehicle, a paramedic area support officer and the Midlands Air Ambulance from Staffordshire to the scene. A West Midlands Ambulance Service spokesman said: “Crews arrived to find a woman lying unconscious in the road and a car that had suffered damage to the windscreen. “The woman, believed to be in her 70s, was treated for a significant head injury and fractures to both of her legs. She was immobilised with the use of a neck collar and spinal board. “She was then airlifted to Queen Elizabeth Hospital Birmingham and was still unconscious on arrival. Unfortunately, her condition is thought to be extremely serious. Wednesday 29th July 2015 – 8.15am – Chris Kowalik. A cyclist was taken to hospital last night as a precaution after a road traffic collision in Staffordshire. 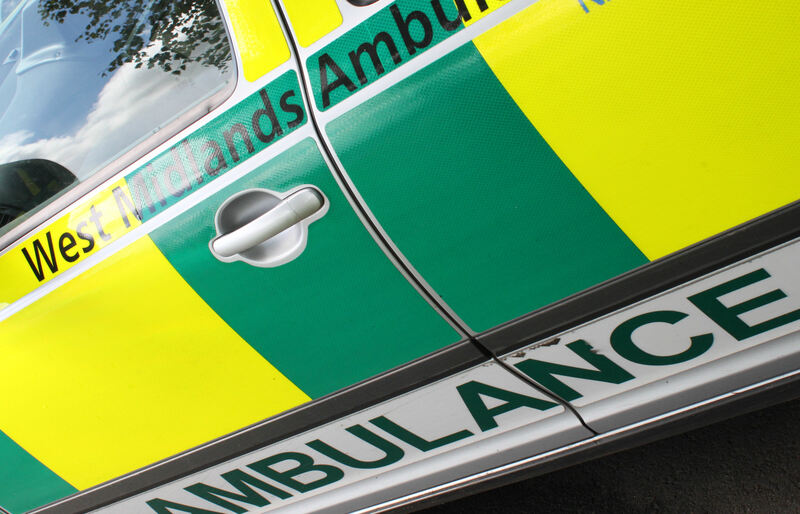 West Midlands Ambulance Service was called to a report of a cyclist in collision with at least one car in Main Road, Brereton shortly before 7.25pm. An ambulance crew, a paramedic area support officer in a rapid response vehicle and the Midlands Air Ambulance from Staffordshire attended. A passing Community First Responder also stopped to help. A West Midlands Ambulance Service spokesman said : “The man who was wearing a cycle helmet was initially reported to have been trapped under a car. Thankfully when crews arrived that turned out not to be the case. It is believed he initially lost consciousness, but he appeared to have just minor injuries. Tuesday 28th July 2015 – 3.50pm – Chris Kowalik. Five people were injured today when a marquee on the Three Counties Showground in Malvern blew over in strong winds. 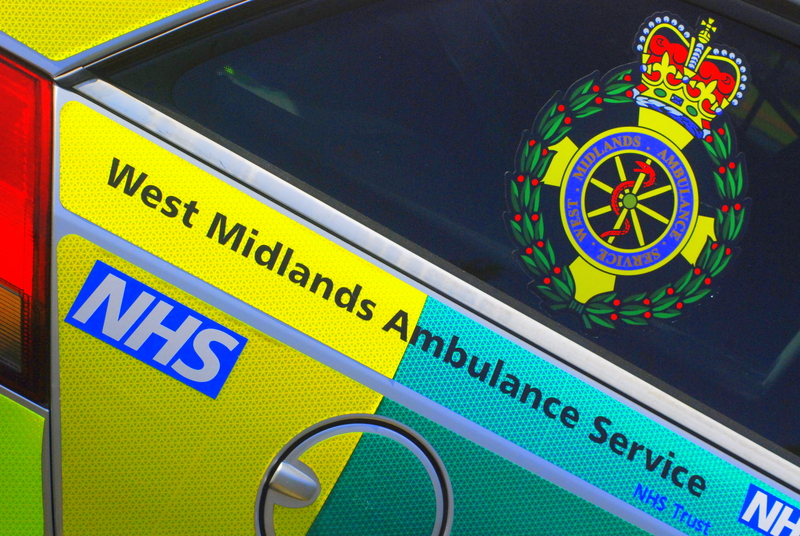 West Midlands Ambulance Service was called shortly after 12.35pm today. Three ambulance crews, a paramedic area support officer, a senior paramedic officer and the Midlands Air Ambulance from Strensham attended. A West Midlands Ambulance Service spokesman said: “The five were struck as they walked into another marquee. “One man had chest injuries. He was immobilised and analgesia was administered before he was taken on blue lights to Worcester Royal Hospital which had been alerted in anticipation of his arrival. “One woman had a suspected broken arm. Another woman had a minor head injury. The were both taken to Worcestershire Royal Hospital. Tonight at 9pm, Crimewatch on BBC One will feature attacks on emergency service staff. One of the ways West Midlands Ambulance Service is dealing with the issue is to provide Conflict Resolution Training to frontline staff to help them defuse potentially violent situations. Tuesday 28th July 2015 – 1.20pm – Chris Kowalik. 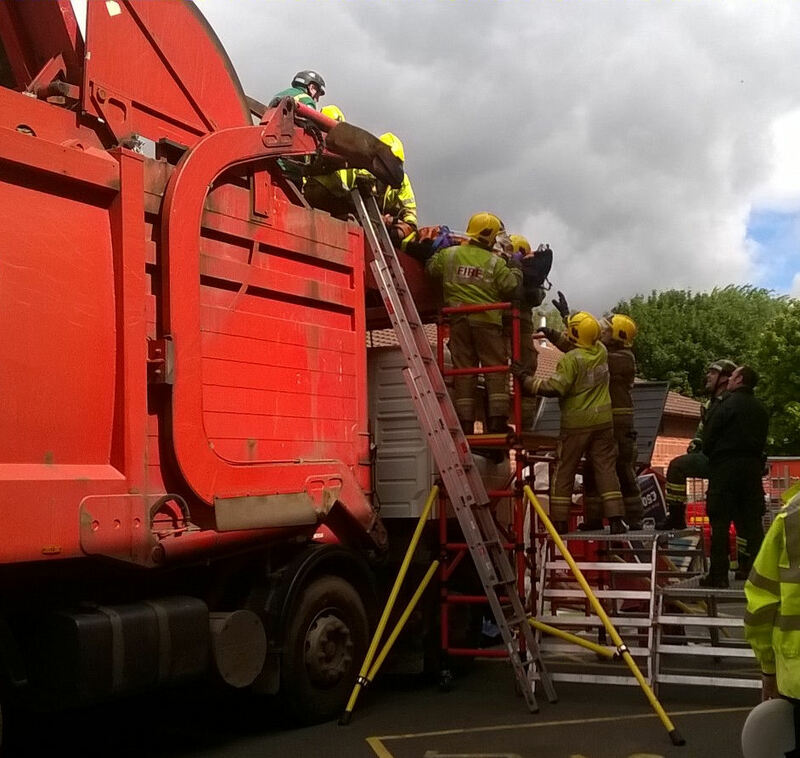 A man has been rescued, apparently without any signs of obvious injury, from inside a bin lorry in Warwickshire. West Midlands Ambulance Service was called to Avenue Road in Nuneaton shortly before 9.45am. An ambulance crew, a paramedic area support officer in a rapid response vehicle, a number of resources from the Hazardous Area Response Team and the Warwickshire and Northamptonshire Air Ambulance attended. A West Midlands Ambulance Service spokesman said: “It appears he was asleep in a large industrial bin, the contents of which were tipped into the refuse lorry. “After the lorry’s machinery had compacted the load, movement was noticed among the rubbish and someone was heard shouting from inside. “Ambulance crews and the fire service worked together to get him out safely in what was a logistically difficult operation. He could only be safely removed via the top of the vehicle. “First, the rubbish had to be moved to be able to reach the man who was given pain relief. He was then immobilised inside the lorry. A fire service ladder was placed inside the lorry. Meanwhile, outside, scaffolding was assembled along the side of the vehicle. Ambulance and fire crews lifted him together up the ladder, over the top of the lorry, then down the side using the scaffolding. “He had pains to his legs and back but further assessments didn’t reveal any obvious injuries. Tuesday 28th July 2015 – 7.00am – Murray MacGregor. A moped rider has suffered multiple serious injuries after being found in a road by another motorist. The incident happened outside the Vauxhall Garage in Trindle Road, Dudley at about 12.30am this morning (Tuesday). A West Midlands Ambulance Service spokesman said: “When crews arrived they found a man of approximately 20 who had suffered serious injuries lying in the road. “It was not known what had happened to him. “He had serious injuries to his chest and back and had suffered an open fracture of his knee. Tonight’s Crimewatch on BBC One at 9pm features a special report on attacks on emergency services staff. Tuesday 28th July 2015 – 6.50am – Murray MacGregor. A woman has been treated by ambulance crews after her car was spun round and ended up in a hedge after a collision with another car. The head on crash happened at just after 6.00pm on Monday evening at Blakes Hill, North Littleton near Evesham. Two ambulances, a rapid response vehicle, a paramedic area support officer and the Midlands Air Ambulance from Stenshem were sent to the scene. 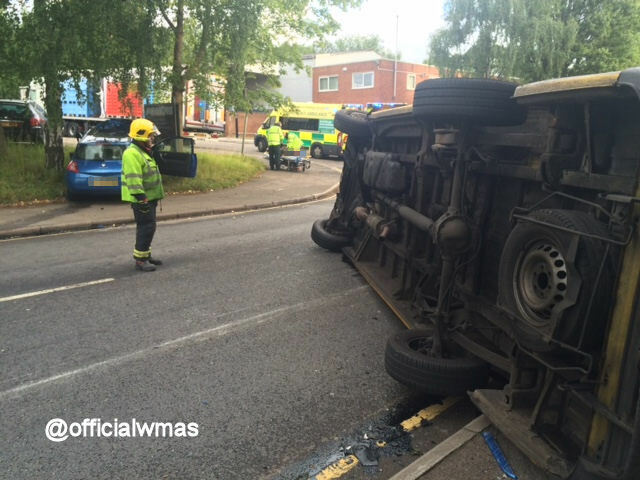 A West Midlands Ambulance Service spokesman said: “Both cars had suffered fairly substantial damage to the front end. One car was facing the opposite direction to the way it was travelling and was in a hedge. 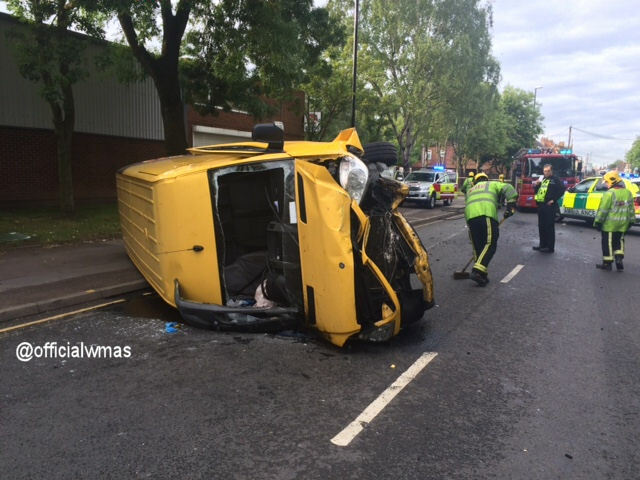 “The woman driving was trapped for a period but ambulance staff worked with firefighters to get her out safely. She was complaining of minor back, hip and chest pain and was taken to the Alexandra Hospital in Redditch by ambulance. “There were three people in the other vehicle. “A 16year old boy who had been in the rear seat had managed to get out of the car but was complaining of right hip pain and had lost many of his front teeth. “He was airlifted to Worcestershire Royal Hospital for the treatment for his serious facial injuries. “The driver, a man of about 20 had also got out himself. 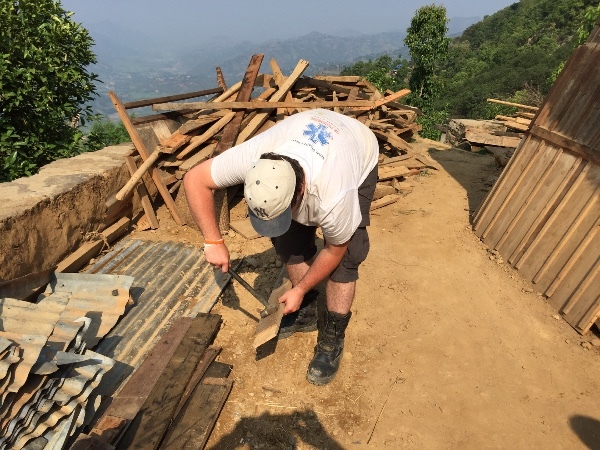 He had suffered a fractured dislocation of his wrist that required strong pain relief. The paramedic from the air ambulance put the wrist back in place before he was taken by land ambulance to Worcester. Monday 27th July 2015 – 3.30pm – Claire Brown. More than 220 people have so far applied to be life savers since the Trust launched its latest student paramedic recruitment drive last week. The 70 vacancies went live on NHS jobs at 10.00am on Thursday 23rd July. Within the space of four days, the Trust has already received a staggering 229 job applications. Louise Harris, Recruitment Advisor, said: “It’s been viewed an incredible 4,201 times on NHS Jobs and, as well as the 229 applications already received, there are also a further 112 live applications online which have yet to be completed and submitted. “Our recruitment team are now working their way through the hundreds of application forms to begin the process of shortlisting candidates. 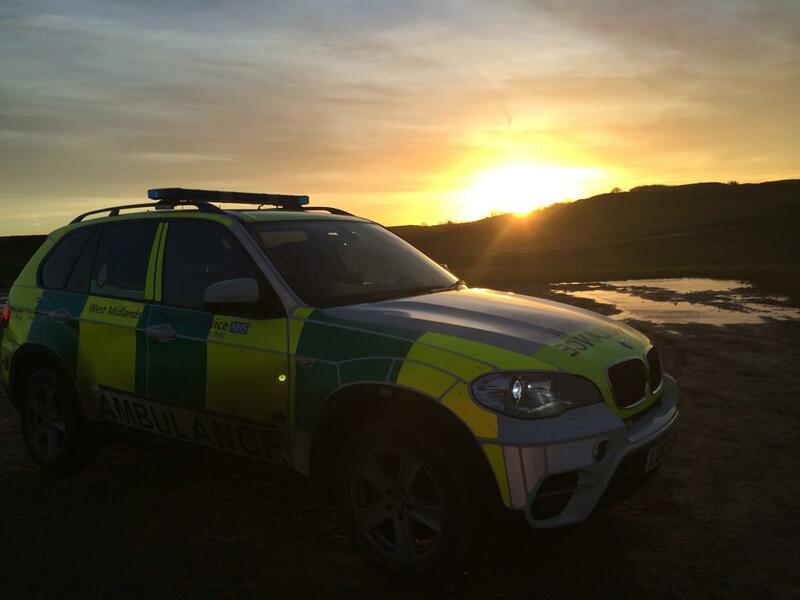 “To avoid stumbling at the first hurdle, I would urge applicants to read the application form fully and don’t forget that you need to have applied for your category C1 driving license before you apply for the student paramedic vacancy. “Please also make sure that you select the appropriate response on the C1 application status question to confirm you have done this to avoid missing out on being shortlisted. Monday 27th July 2015 – 10.20am – Claire Brown. Two men were trapped in their car following a collision with a lorry on the Warwickshire and Northamptonshire border earlier this morning. 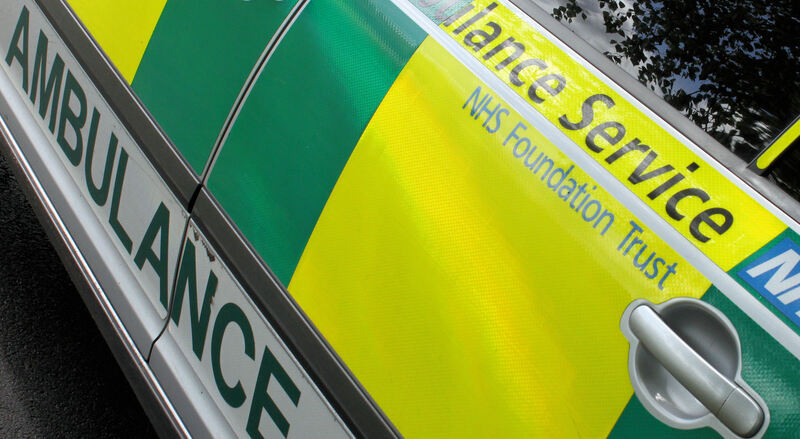 West Midlands Ambulance Service was called to reports of a collision between a car and a lorry on the A5 between Clifton upon Dunsmore and Lilbourne at 5.40am today (Monday). Two ambulances, a paramedic area support officer, a community paramedic and a BASICS doctor attended the scene. 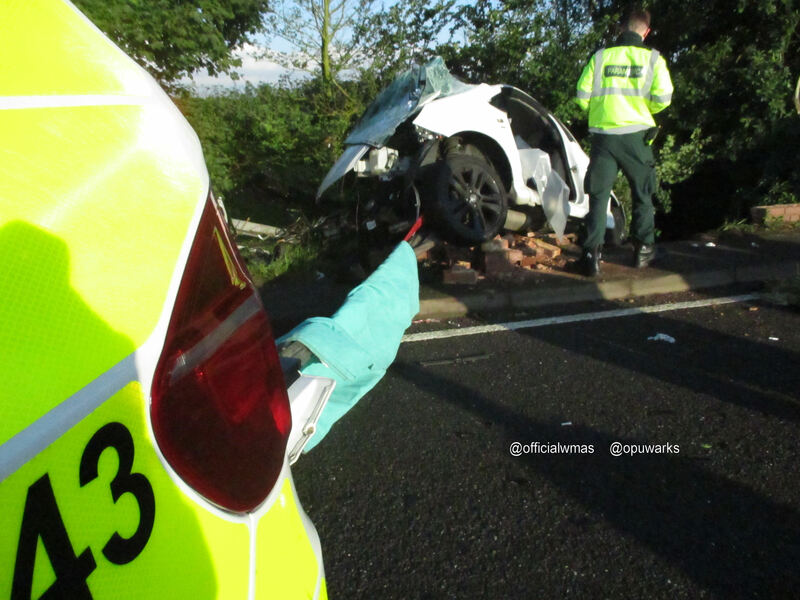 A West Midlands Ambulance Service spokeswoman said: “When crews arrived they found a car which had been involved in a significant collision with the rear of a lorry. The driver and passenger of the car, both men, were trapped in the wreckage. Monday 27th July 2015 – 9.00am – John Hawker. A car has crashed onto a house overnight in Worcestershire leaving a man injured. 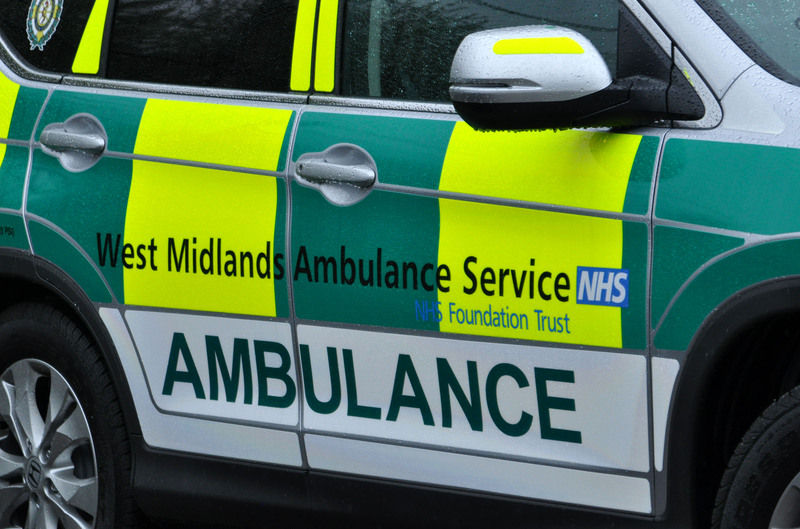 West Midlands Ambulance Service were called to Bransford Road at around 11.20pm last night. A rapid response vehicle, an ambulance, a paramedic officer and the Trusts MERIT Team attended the scene. A West Midlands Ambulance Service spokesman said: “Crews arrived to find a car that had left the road and crashed into a house. The car and the house had suffered extensive damage. “A passenger in the car, a man believed to be in his 20’s, suffered multiple injuries in the crash and received emergency treatment at the scene. The man was transferred by ambulance to Worcester Royal Hospital for further treatment. “The woman who was in the house at the time of the crash was shook up by the incident and was checked over by ambulance crews but did not require further treatment. Monday 27th July 2015 – 7.00am – John Hawker. Four people have been injured, two seriously following an RTC in Hall Green, Birmingham in the early hours of this morning. The crash occurred on Stratford Road, near the junction of Highfield Road at around 1.30am. Four ambulances a paramedic officer and the Trusts MERIT Team were at the scene. A West Midlands Ambulance Service spokesman said: “An ambulance came across the RTC on the way back to station and immediately requested back up to the scene. “It is believed a car carrying four people left the road and was in a significant collision with a tree. The car had suffered extensive damage. “A teenage passenger travelling in the car suffered serious head, chest and leg injuries. The girl, believed to be around 14 years old received emergency treatment at the scene, and due to the serious nature of her injuries was anaesthetised by the trauma Doctor. “Once the girls condition was stabilised she was transferred by land ambulance to Queen Elizabeth Hospital Major Trauma Unit for further emergency treatment. The trauma doctor travelled on board the ambulance continuing with treatment to hospital. “Unfortunately the girls’ injuries were considered life threatening. “A second teenage girl, believed to be around 19 years old, suffered serious pelvic and hip injuries in the crash. She also received emergency treatment at the scene by medics and was transferred to the same hospital for further treatment. “A woman, believed to be in her late 40’s, suffered back, leg and arm injuries in the crash. The driver, believed to be a man in his late teens, suffered minor injuries. “Both received treatment at the scene and were transferred by ambulances to Heartlands Hospital for further treatment. Sunday 26th July 2015 – 6.15pm – John Hawker. 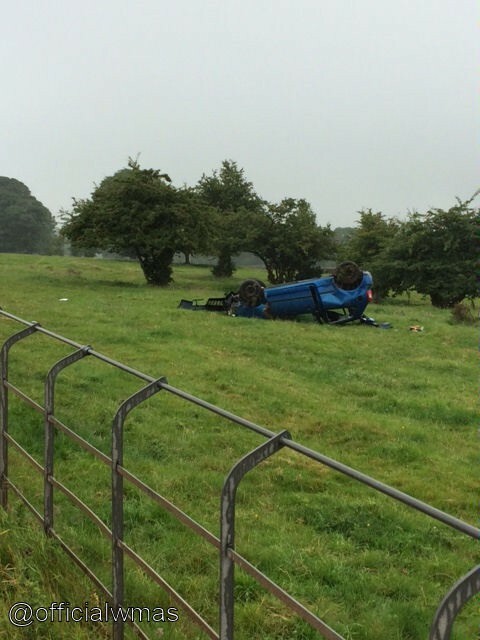 Four teenagers have had a miraculous escape after the car they were travelling in left the road, cleared a fence and landed on its roof in a field in Staffordshire this afternoon. 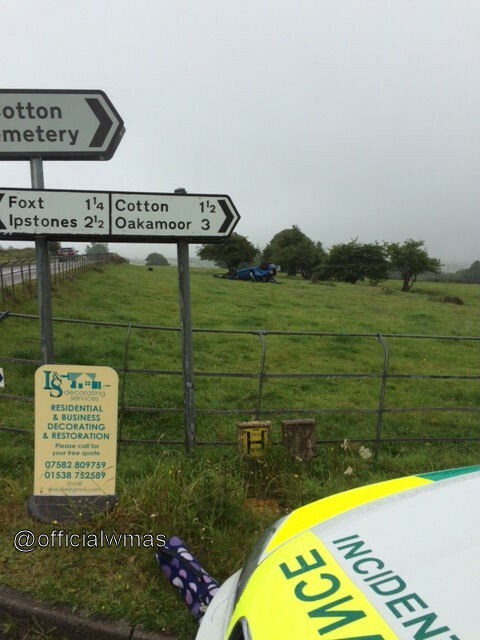 The crash occurred on the A52 Cotton Lane, Cotton at around 3.00pm. A community first responder, a rapid response vehicle, three ambulances and a paramedic officer attended the scene. A West Midlands Ambulance Service spokesman said: “Crews arrived to find a car that had left the road, travelled over a fence at the side of the road, and come to rest around 20 yards into a field on its roof. “Miraculously the four teenagers travelling in the car all suffered relatively minor injuries. One girl suffered neck and back pain, a second girl suffered abdominal pain and bruising and the two teenage boys suffered a hand injury and the effects of shock. All four were believed to be 17 years old. “All four patients received treatment at the scene from medics and all four were subsequently transferred by ambulances to Royal Stoke University Hospital for further assessment and treatment. Sunday 26th July 2015 – 5.15pm – John Hawker. A man has been seriously injured after the car he was driving left the road and hit a tree in Rugby this afternoon. The crash occurred on the A45, Stretton on Dunsmore at around 12.45pm. An ambulance, a paramedic officer and the air crew in a rapid response vehicle from Warwickshire and Northamptonshire Air ambulance attended the scene. 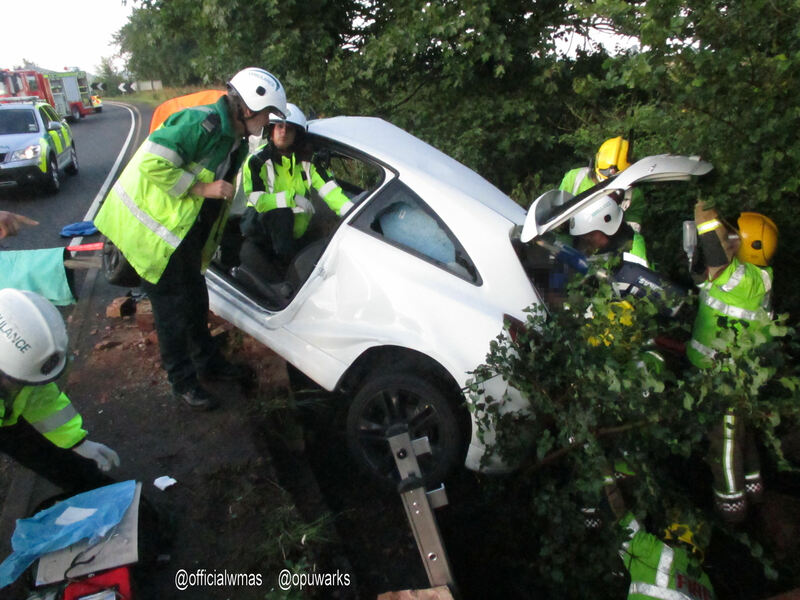 A West Midlands Ambulance Service spokesman said: “Crews arrived to find a car that had left the road and hit a tree. The car had suffered substantial damage and the man driving was seriously injured. “The man, believed to be in his early 20’s, suffered serious head, chest, pelvic, leg and arm injuries in the crash and was trapped in the vehicle. “He received emergency treatment from medics whilst still in the car and he was extricated with the assistance of the fire service. In total he was trapped for around 45 minutes. 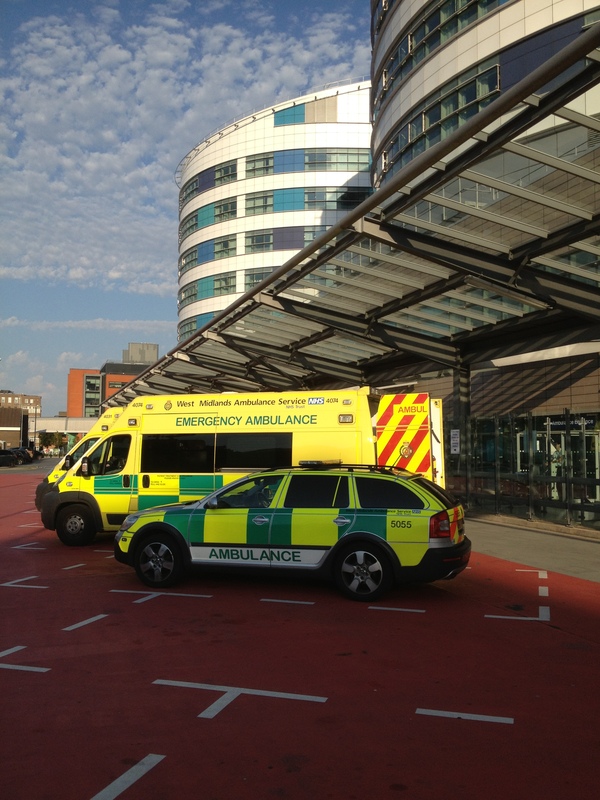 “Due to the man’s serious injuries, he was anaesthetised by the trauma doctor before being transferred by land ambulance to University Hospital Coventry and Warwickshire for further emergency treatment. “The hospital had been pre alerted to the man’s arrival and serious injuries. Sunday 26th July 2015 – 10.30am – John Hawker. 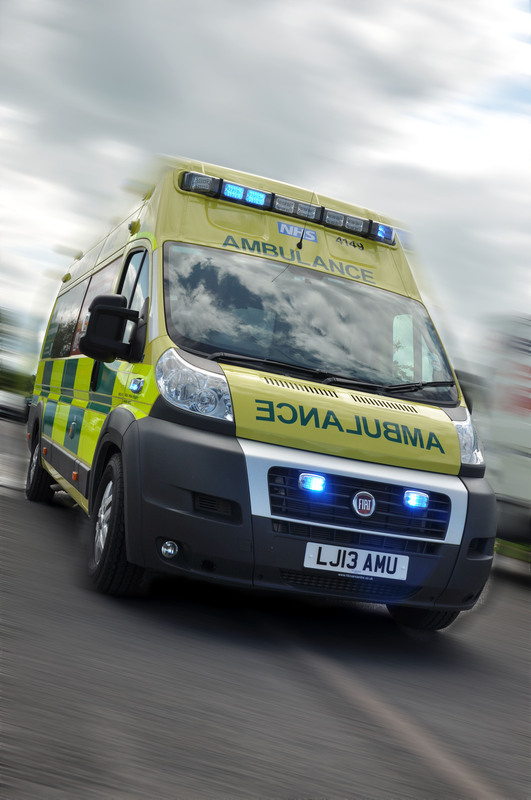 A child has suffered serious injuries after being in collision with a car in Staffordshire last night. West Midlands Ambulance Service were called to Burton Rugby Club, Lichfield Street at around 8.40pm. A rapid response paramedic, an ambulance, a paramedic officer and the Midlands Air Ambulance from Staffordshire attended the scene. A West Midlands Ambulance Service spokesman said: “Crews arrived to find a boy, believed to be four years old that had suffered head and facial injuries in the incident. “The child received emergency treatment at the scene and his condition was stabilised. 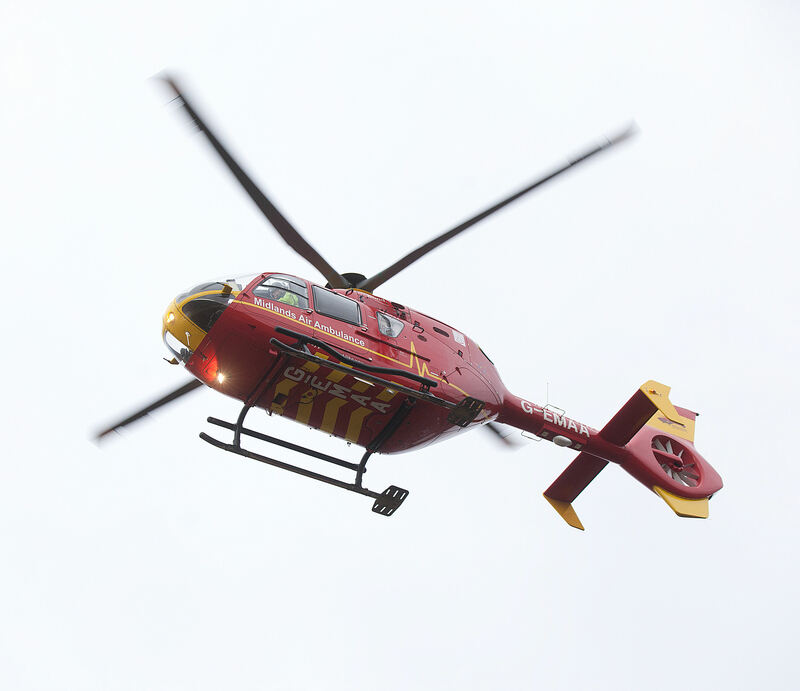 The boy was then airlifted to Birmingham Childrens Hospital for further emergency treatment. Sunday 26th July 2015 – 10.15am – John Hawker. 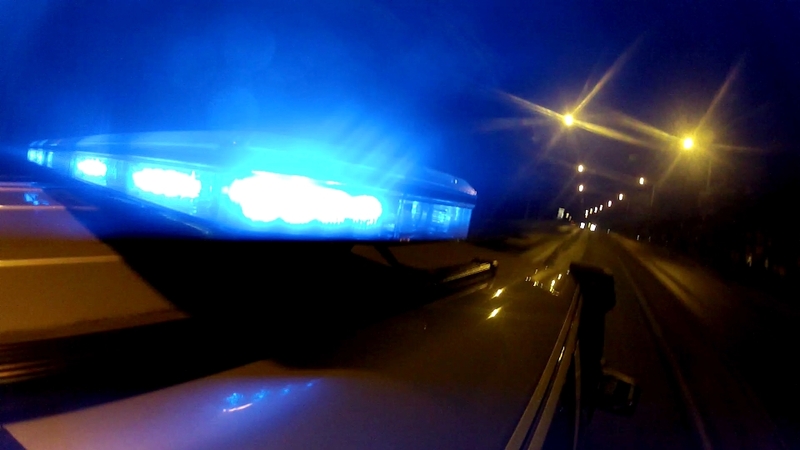 A man has died following an RTC in Coventry last night. The crash occurred near the junction of Winston Avenue and Winston Close at around 8.00pm. An ambulance, a paramedic officer and a BASICS Doctor attended the scene. A West Midlands Ambulance Service spokesman said: “Crews arrived to find a motorcycle and a car that had been in significant collision. “The man riding the motorcycle had suffered multiple serious injuries in the crash. Advanced life support was carried out by medics but unfortunately, despite their best efforts, nothing could be done to save the man and he was confirmed dead at the scene. Saturday 25th July 2015 – 7.40pm – John Hawker. A motorist has been extremely fortunate not to have suffered serious injuries as the car she was driving left the road, crashed into a woodland ditch and caught fire. The crash occurred on Heighley lane, Madeley, Staffordshire at around 2.20pm this afternoon. A community first responder, an ambulance and a paramedic officer attended the scene. A West Midlands Ambulance Service spokesman said: “Crews arrived to find a car that had left the road and come to rest in a ditch in woodland. “Fortunately, the woman driving the car had managed to escape from it and was in shock and suffered minor facial injuries. “The car had set on fire after the crash along with some nearby trees and bushland. “The woman, believed to be in her 70’s, was treated at the scene for her injuries and the effects of shock and transferred to Royal Stoke University Hospital for further assessment and treatment. Saturday 25th July 2015 – 7.10pm – John Hawker. 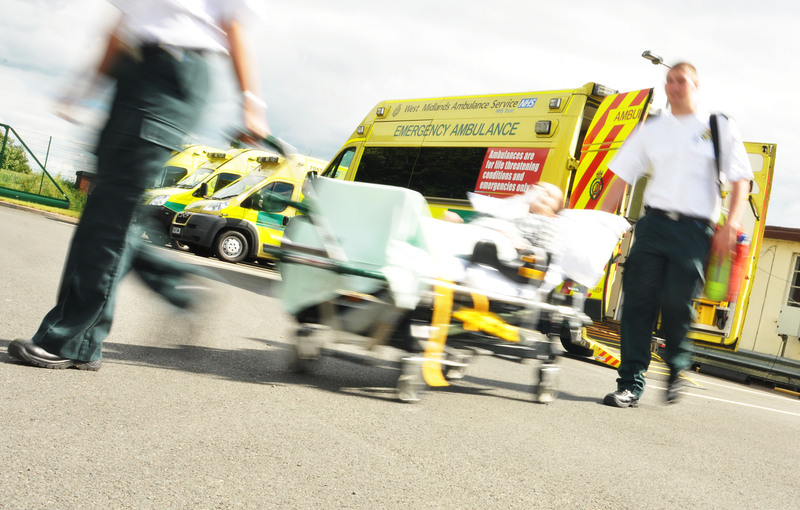 A motorcyclist has suffered serious injuries after a crash in Warwickshire this morning. The crash occurred on the A49 Alcester Road, Redhill at around 11.50am. A rapid response paramedic, an ambulance, a paramedic officer and the Warwickshire and Northamptonshire Air Ambulance attended the scene. “The man riding the motorcycle, believed to be in his early 60’s, suffered pelvic, leg, hip and arm injuries in the crash. He received emergency treatment from medics and his condition was stabilised. “The man was then airlifted to University Hospital Coventry and Warwickshire for further emergency treatment. Saturday 25th July 2015 – 6.45pm – John Hawker. A young boy has suffered serious injuries after being in collision with a car in Worcestershire this morning. The incident occurred on Exhall Close, Church Hill South, Redditch at around 11.35am. A West Midlands Ambulance Service spokesman said: “Crews arrived to find a young boy with serious leg injuries, suspected pelvic injuries and also abrasions to his face and arms. “The boy, believed to be six years old, received emergency treatment at the scene from medics including pain relief. The child’s condition was stabilised and he was then airlifted to Birmingham Childrens Hospital for further emergency treatment. “The hospital had been pre alerted to childs arrival by air ambulance and his injuries. Saturday 25th July 2015 – 6.00pam – John Hawker. 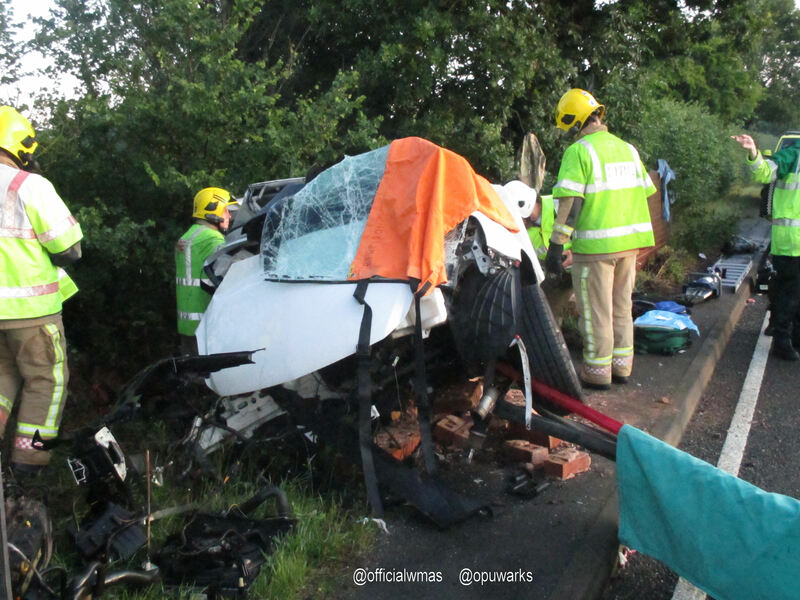 A man was trapped in the car he was driving for an hour in the early hours of this morning following an RTC in Warwickshire. The incident occurred on the A429, between Wellesbourne and Barford at around 5.45am. One ambulance, a rapid response vehicle, a paramedic officer and the Trusts MERIT Team attended the scene. A West Midlands Ambulance Service spokesman said: “Crews arrived to find a car that had left the road, struck a bridge and was hanging over a drop of around 20 feet to a river below. “Before the patient could be accessed the car was made safe by being securely attached by a tow rope to other vehicles. “Once the vehicle was secure, ambulance crews treated the man, believed to be in his early 20’s, for serious arm injuries and suspected internal injuries. “The man was extricated from the car with the assistance of the fire service and once released received further treatment at the scene. “Once the man’s condition was stabilised, he was transferred by land ambulance to University Hospital Coventry and Warwickshire for further emergency treatment. The MERIT team trauma Doctor travelled on board the ambulance to hospital continuing with treatment. “The hospital had been pre alerted to the patients condition and his injuries. Saturday 25th July 2015 – 3.00pm – John Hawker. 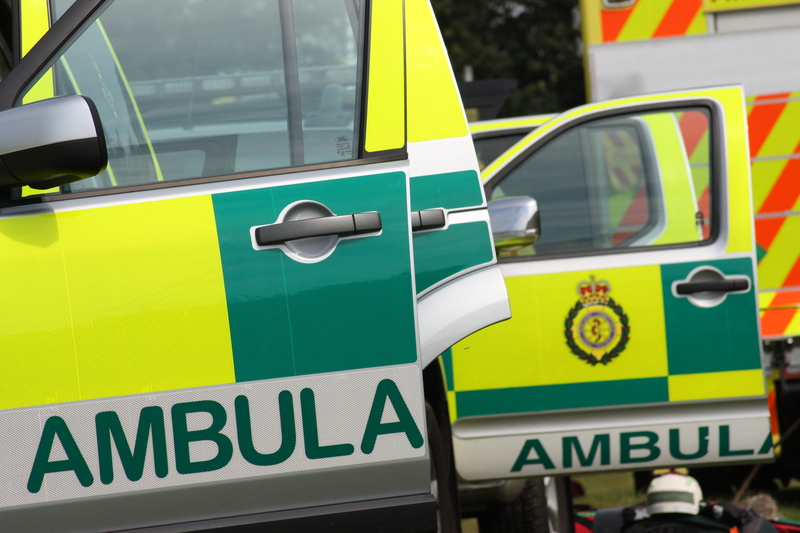 A man has died following an RTC in Shropshire this morning. The crash occurred on the A49, just outside Church Stretton at around 7.45am. An ambulance, a rapid response vehicle and a paramedic officer attended the scene. A West Midlands Ambulance Service spokesman said: “Crews arrived to find a pick up truck and a HGV that had been in a serious collision. 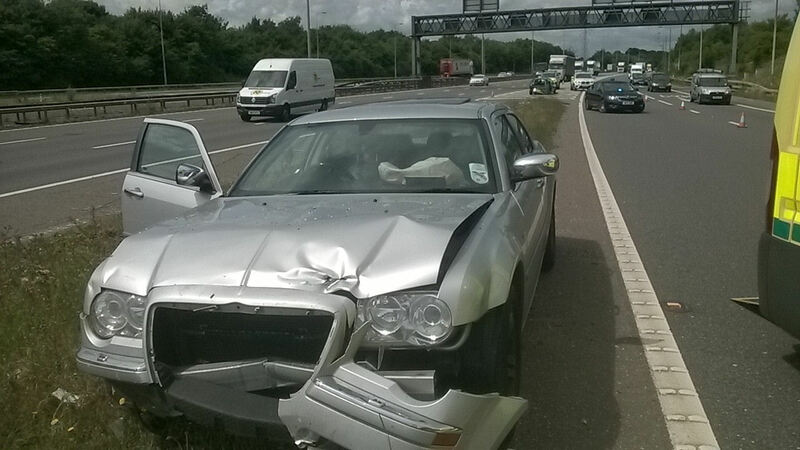 Both vehicles had suffered significant damage. “Unfortunately, it quickly became apparent nothing could be done to save the man driving the pick up truck, and sadly he was confirmed dead at the scene. Saturday 25th July 2015 – 9.30am – John Hawker. 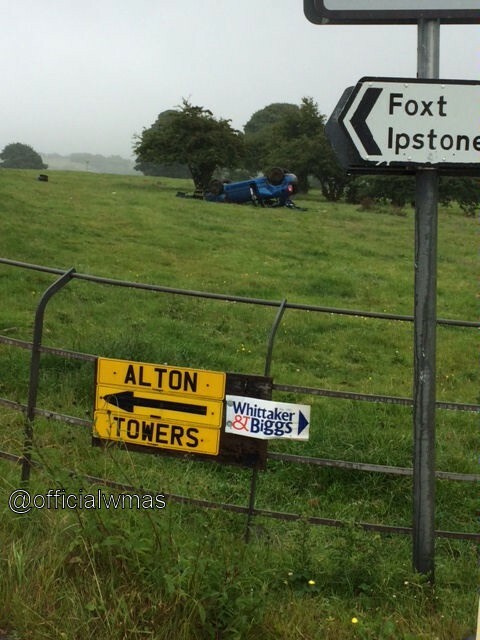 Saturday 25th July 2015 – 8.45am – John Hawker. A teenager has been rescued from fields and woodland in Coventry following an incident in the early hours of this morning. The rescue of the patient took around two and a half hours in total and was successfully carried out using excellent team work by emergency crews at the scene. The incident occurred on Pavilion Sowe Common, near Woodway Lane, at around 1.30am. Two ambulances, a paramedic officer, and the Trusts Hazardous Area Response Team attended the scene. A West Midlands Ambulance Service spokesman said: “We were called to reports of a teenager who had suffered some sort of medical episode and had subsequently suffered cuts to his legs and a suspected chest injury. The cuts were believed to have been caused by falling on to glass bottles at the scene. “The first ambulance crew that arrived found access to the patient limited and requested back up. They walked with their medical equipment through fields using torches as guidance for around 15 minutes until they reached the patient. 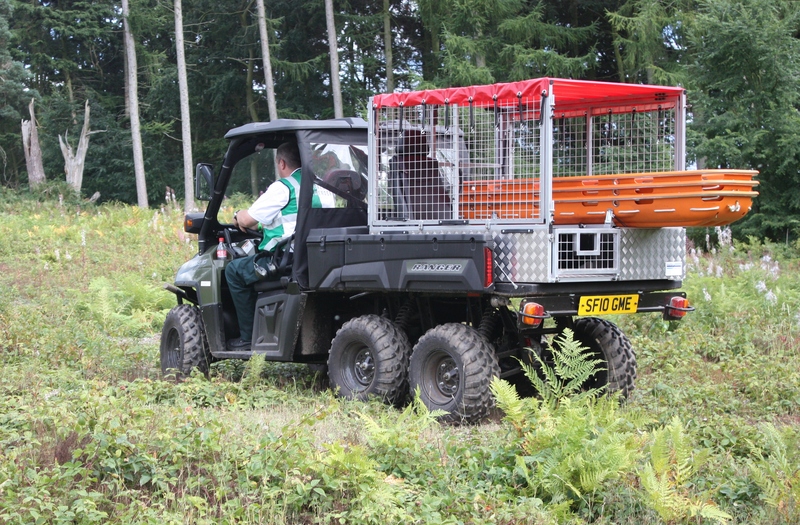 No access was possible by any normal vehicle as the patient and his friends were around one mile deep into the common near a tree lined coppice. 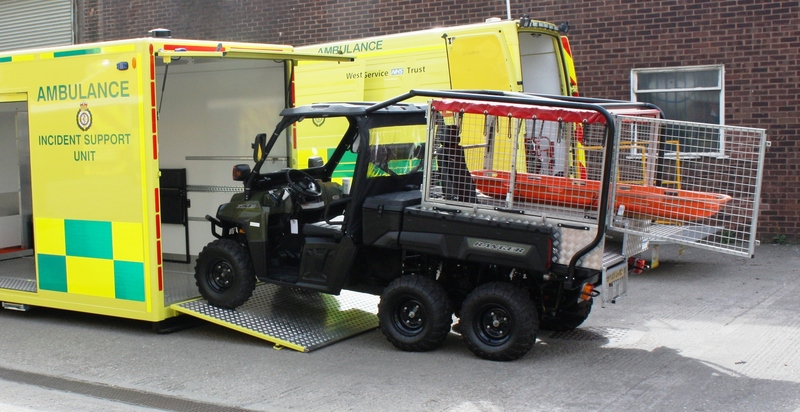 “As the crew treated the 17 year old for his injuries, including receiving pain relief, other ambulance crews arrived including the Trusts HART team who have a 6×6 polaris vehicle. Friday 24th July 2014 – 2.00pm – Claire Brown. A group of teenagers have been learning about life behind the nines with West Midlands Ambulance Service. Health service savvy students from schools in Birmingham, the Black Country, Coventry, Warwickshire, Worcestershire and Shropshire spent last week at Erdington Hub in Birmingham as part of the Trust’s work experience programme. 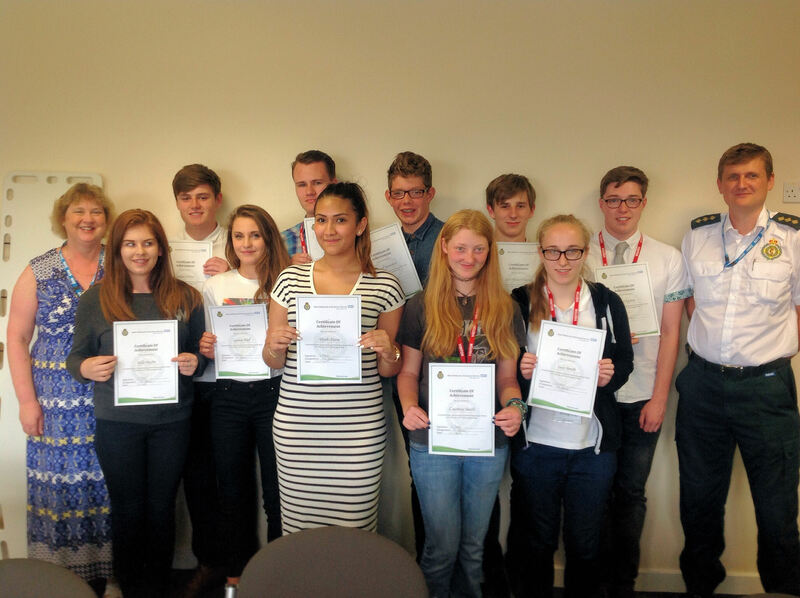 The 12-strong group of teenagers aged between 14 and 18 met a range of operational staff, including paramedics from the Trust’s Hazardous Area Response Team (HART), to find out more about their roles and responsibilities. The students discovered how 999 calls are handled, the work of community first responders (CFRs), the management of trauma patients and how the Midlands Air Ambulance help patients. The teens also got to grips with the back of an ambulance and had a go at using an automated external defibrillator (a device used to restart someone’s heart when they’ve suffered a cardiac arrest) to test their life saving skills. Diane Pittom, the Trust’s Organisational Development Officer, said: “We’ve been really pleased to, once again, host students for a work experience placement. Engaging with young people is an important investment for us and helps to further enhance the quality of our future workforce. This opportunity has allowed the students to see beyond the blue lights and explore the service ‘behind the scenes’ to discover to broad range of roles that make up the ambulance service. Pictured (left to right) with certificates: Diane Pittom, Sofia Hayler from Evesham, Joshua Gittins from Walsall, Lauren Wall from Sutton Coldfield, Jamie Bunting from Bromsgrove, Aliyah Ataria from Birmingham, Miguel Saunders from Kidderminster, Courtney Smith from Halesowen, Jack Wastell-Mann from Coventry, Lucy Smith from Telford, James Layton from Stratford-upon-Avon, Erdington Assistant Area Manager Phil Calow. Friday 24th July 2015 – 9.20am – Claire Brown. 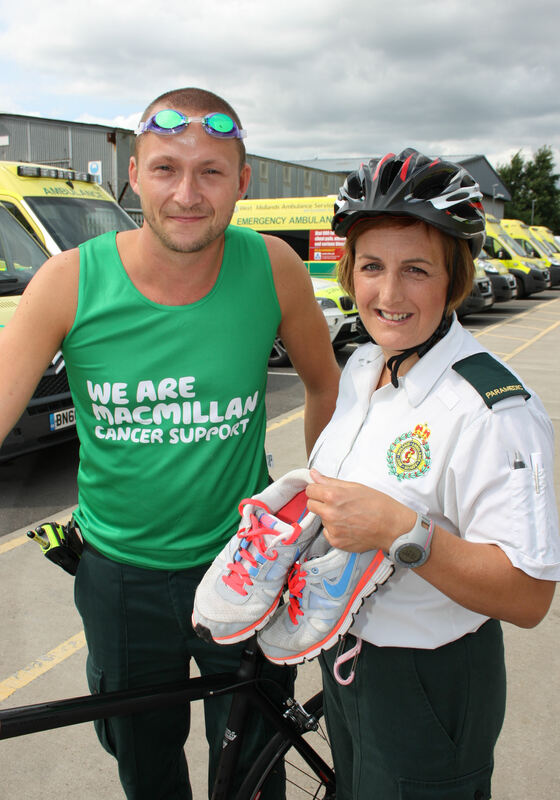 Three paramedics from Willenhall Hub are joining forces to take on a 51 ½km triathlon in London next month. Derek Varden, Dave Bentley and Rhoda Young all live in South Staffordshire and will be swimming 1 ½ km, cycling 40km and running 10km in London on the 8th August to raise money for various charities. Derek, who is also bringing along his two sisters and a friend to complete the race, has previously done a triathlon but hasn’t done anything on this scale before. Derek said: “I’ve been trying to train as much as possible to prepare for the event. I’m raising money for Macmillan, which is a charity close to my heart as I’ve lost two people to cancer this year. Dave and Rhoda are racing to support other charities which are very important to them. Pictured: Derek Varden and Rhoda Young at Willenhall Hub. Friday 24th July 2015 – 6.45am – John Hawker. 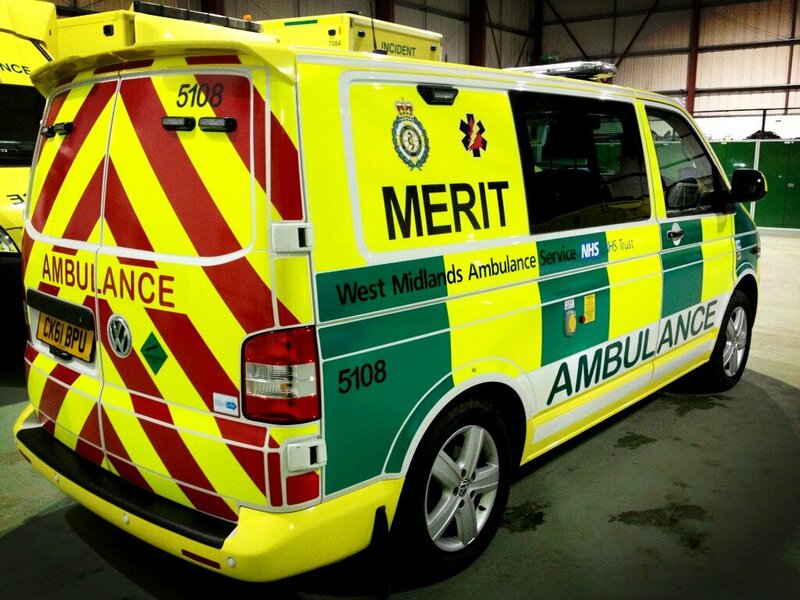 A pedestrian has received trauma care at the scene of an RTC in Birmingham last night. The incident occurred on Walford Road, Sparkbrook at around 10.45pm. An ambulance, a paramedic officer and the Trusts MERIT Team with a trauma doctor on board attended the scene. A West Midlands Ambulance Service spokesman said: “Crews arrived to find a pedestrian that had been injured after being in collision with a car. The car had significant damage to the bonnet and windscreen. “The pedestrian, a man believed to be in his 20’s, received trauma care at the scene by medics for head and leg injuries. He was administered with pain relief, a leg splint applied and immobilised using a spinal board and neck collar. Thursday 23rd July 2015 – 11.15pm – John Hawker. A woman has suffered serious injuries after the horse she was leading bolted and trampled on her. The incident occurred on Fockbury Mill Lane, Dodford, Worcestershire at around 6.45pm. An ambulance, a paramedic officer, the Midlands Air Ambulance from Strensham and the Trusts MERIT Team attended the scene. A West Midlands Ambulance Service spokesman said: “The woman was apparently leading the horse along the lane when it became spooked and bolted. “Unfortunately as it bolted it knocked the woman over and trampled on her. “The woman suffered serious facial injuries and also head and shoulder injuries. She received emergency treatment by the ambulance crew who treated her injuries and immobilised her using a spinal board and neck collar. “The crew were joined on scene by the Air Ambulance Crew and MERIT Trauma team who also administered treatment before the woman was transferred by land ambulance to Queen Elizabeth Hospital Birmingham for further assessment. The trauma Doctor and Paramedic travelled on board the ambulance with the crew on route to hospital. Thursday 23rd July 2015 – 8.20pm – John Hawker. 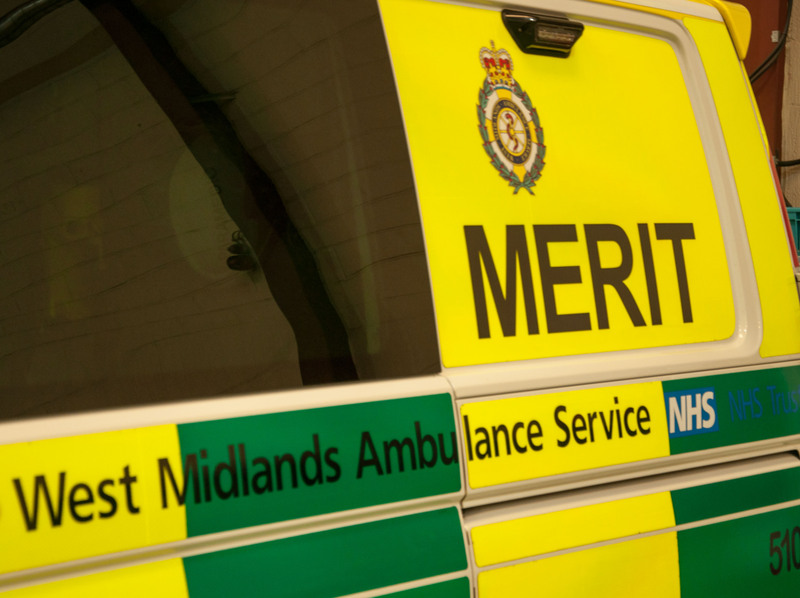 A motorcyclist has been thrown around twenty metres following a crash in Staffordshire this evening. The crash occurred at the junction of Church Road and Clays Lane, Branston, Burton on Trent at around 6.15pm. Two ambulances, a paramedic officer and the Midlands Air Ambulance from Stafford attended the scene. 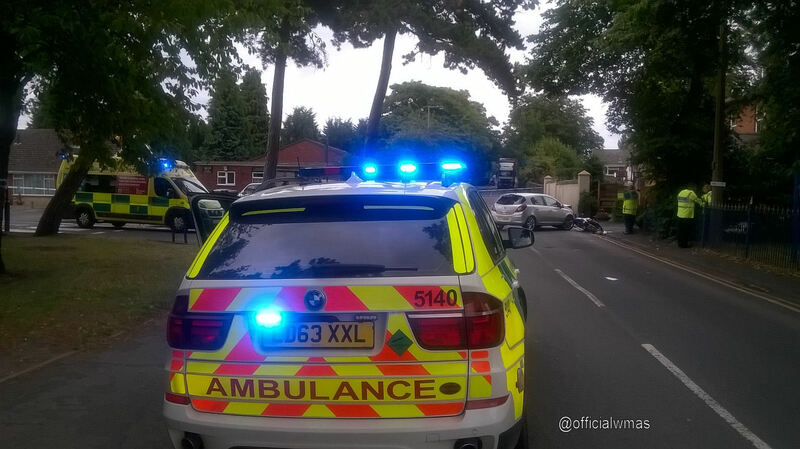 A West Midlands Ambulance Service spokesman said: “Crews arrived to find a car and a motorcycle that had been in a significant collision. The motorcyclist was found around twenty metres from where the crash occurred and was unconscious on the road. “The man, believed to be in his late 20’s, had suffered head and pelvic injuries. He received emergency treatment at the scene from medics and then regained consciousness after a short time. “Emergency treatment continued at the scene and the patient’s condition was stabilised. 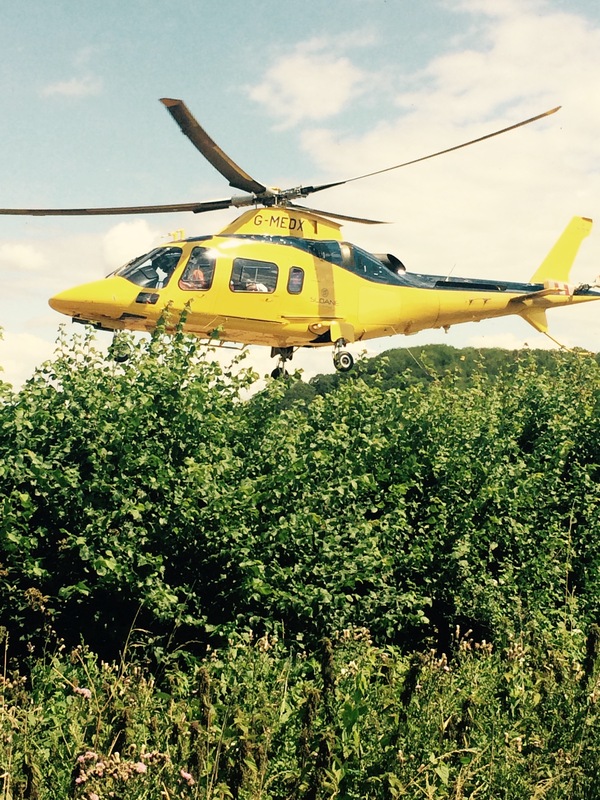 He was then airlifted to Royal Stoke University Hospital for further emergency treatment. The hospital had been alerted to his arrival and his injuries. “A pillion passenger, a man also believed to be in his late 20’s, was lucky to escape the crash with just neck pains. He also received treatment from ambulance crews before being transferred by land ambulance to Queens Hospital Burton for further treatment. Thursday 23rd July 2015 – 1.30pm – Chris Kowalik. A family of four is considered fortunate not have been seriously injured in a crash on the M6 southbound carriageway at junction 2 today. West Midlands Ambulance Service was called shortly after 11.40am this morning and sent a senior paramedic officer in a rapid response vehicle and two ambulance crews. An off-duty paramedic also stopped to help. A West Midlands Ambulance Service spokesman said: “The family’s Corsa had collided with a lorry and a second car before coming to rest on the chevrons at the junction 2 exit slip road. 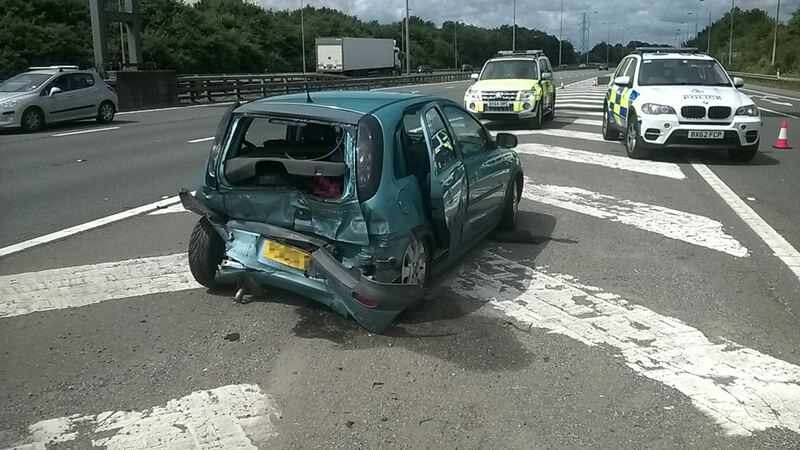 “The only casualty from this car was a 22 month old boy who had a minor leg injury. He was taken to University Hospital Coventry and Warwickshire accompanied by his mother, father and another child all of whom were uninjured. Crews at the scene said they were lucky. Thursday 23rd July 2015 – 8.30am – Chris Kowalik. 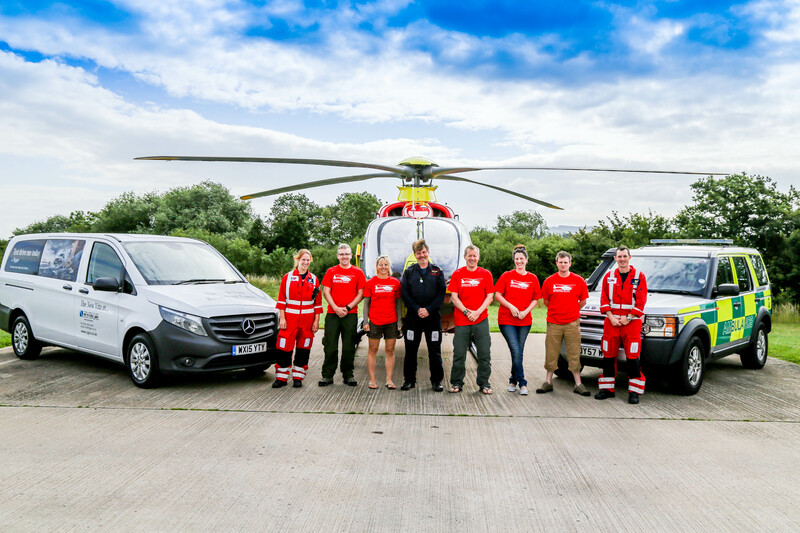 Paramedics and Emergency Medical Technicians based at Worcester’s ambulance hub are to do the Three Peaks Challenge in aid of Midlands Air Ambulance next month. On Saturday 29th August, Technician Neil Gibson and Paramedics Giles Griffiths and Simon Tacey, and Giles’ partner Jocelyn Brooks (a sports psychologist at Worcestershire County Cricket Club) will aim to climb the highest peaks of Scotland (Ben Nevis), England (Scafell Pike) and Wales (Snowdon) within 24 hours. They will be supported by a team of drivers consisting of Worcester-based Emergency Medical Technician Martin Sharpe, Paramedic Area Support Officer Dave Macdonald and West Bromwich-based Paramedic Sarah Kent. Their aim is to raise at least £2,500; the approximate average cost of sending an air ambulance to one incident.